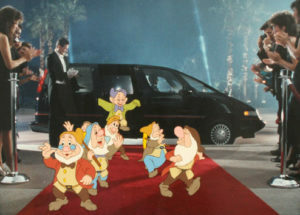 The 61st Academy Awards ceremony took place on Wednesday, March 29th, 1989 and featured a one minute commerical entitled “Premiere” introducing Chevrolet’s new Lumina at the Disney MGM Studios (set to open May 1, 1989). The commercial was a clever combination of live action and animation. 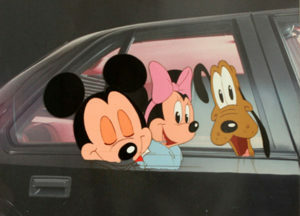 All three of Chevy’s new cars were showcased in the premiere commercial with Mickey Mouse (in a white tuxedo so he stood out against the black background of the car), Minnie (in an elegant white gown), Donald Duck, Daisy Duck and Pluto exiting the first car. Goofy (also in a white tuxedo) and Donald’s nephews (Huey, Dewey and Louie) coming out of the second and the Seven Dwarfs popping out of the minivan. Executive producer of the commercials Craig MacGowan had only four months to do all the commericals, including postproduction which included putting the animated characters in the previously shot live action, in order to meet the deadline of showing the “Premiere” commercial on the Academy Awards presentation. Live action shooting took two weeks and produced the sixty second premiere ad with the Disney characters at the Disney MGM Studios’ Chinese Theater for a nightime Hollywood premiere and all three Luminas as well as seven other fifteen second daytime TV spots. In addition there was a thirty-second sweepstakes announcement. Among those fifteen second commercials were six dancing hippos from Fantasia (1940) clad in tutus joyfully coming out of a hotel on the backlot New York Street and easily fitting into the Lumina four door sedan because it had such a roomy interior. The three good faires from Sleeping Beauty (1959) scattered magic dust around a sedan to promote the bumper-to-bumper protection warranty. 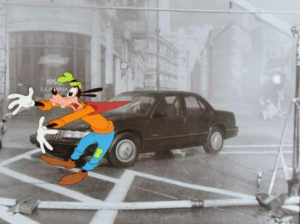 Goofy on the backlot New York Street battled typhoon force winds (perhaps coming from Typhoon Lagoon that also opened that year) and withstands them just as well as the galvanized steel body panels on the Lumina. The Fairy Godmother from Cinderella (1950)… and so on. The sixty second commercial had eighteen separate scenes and each required a different camera angle, lighting array, special effects, extras, props and, of course, the addition of the famous Disney characters in animated form. Producer MacGowan explained that the live action shooting was just the smallest part of the overall process to writer Don Sherman in a 1989 special issue of Friends travel magazine. “It’s called interactive animation. The actual technique that mixes live and animated film is known as ‘compositing’. What we do is shoot normal film that contains the backgrounds, the props, the live action and the special effects such as smoke and fireworks. “Everything BUT the animation. Of course, we must make certain accomodations for the animated characters to fit in properly. For example, if an actor in one of the segments talks to Goofy, he has to know how tall Goofy is and exactly where he will be so the conversation looks convincing in the final film. We rehearse with full size props like sometimes a cutout standee. Then, when the actor has it embedded in his mind where Goofy will be, he delivers his lines in front of a live camera without the prop. “We knew going in that what we wanted was the ‘Roger Rabbit’ look. We had so little time to turn this job around that I knew we couldn’t train anyone with new and difficult film techniques. What we did instead was hire the actual experts who had worked on Roger Rabbit from the award-winning cinematographer Dean Cundey (who was named director of the production) and the film editor, Artie Schmidt, to the script gal and so on. Director Cundey added, “The techniques we perfected during the production of Who Framed Roger Rabbit (1988) really let us create a very convincing illusion – that animated characters could exist in a live-action world. It goes way beyond the simple addition of flat, two-dimensional characters to a normal piece of film, which has been done many times in the past. “What we did was develop lighting and camera techniques that together help create a far more complex illusion. The animated characters then become more lifelike. They move around the room, cast shadows and reflect light just like a real human being would. Creating a fantasy world so real that people believe it exists is what I truly enjoy about this work. “The key difference is that Roger Rabbit was all done with film while the Lumina commericals use digital electronics to make the composites. This permits us to make what amounts to camera moves in the postproduction phase. With digital techniques, we can actually track (change camera position) and zoom (move in for a closer view) even though the camera was actually fixed when we shot the film. Twelve thousand feet of film was exposed during the Florida shoot but would need to be edited down to roughly 300 feet or so to be used in the finished commercials. Sound tracks, animation, shading mats and various computer-generated graphics were added during the process that would total nearly five times the number of days of the original live action shoot. Once the film was edited from the raw footage by Artie Schmidt (who did some of the editing simultaneously with the live action shooting) that rough cut had to be approved by the client. Once that was done, just like for Roger Rabbit, photostats (basically still photos) from the film were used to create frames over which animators laid their animation paper and drew in the figures to interact with the live action since they could see where the live action was. Again, that animation had to be approved in a rough pencil test before it was sent for the pencil drawings to be transferred to cels and ink and painted. 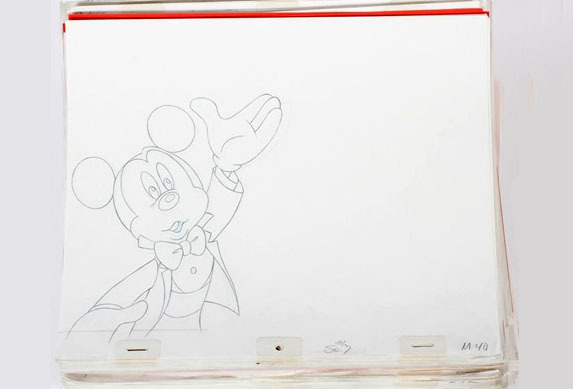 It was estimated that the commericals required over 5,000 animation elements with each animator providing only about three seconds of finished animation a week. When the cels were finished, they were photographed frame-by-frame with a special 35 millimeter camera rig. Then, the final step was an outside firm taking the live action footage, the animation and the sound track and doing digital-electronic compositing for something that would only be seen briefly on a TV screen and then never rerun after a few weeks of sales promotion. Even then, color and exposure corrections were done to make everything looked as seamless as possible. While the end of the one minute commercial had a gleeful Mickey popping up in the left hand corner of the screen saying “See Ya Real Soon!”, it was not to be. 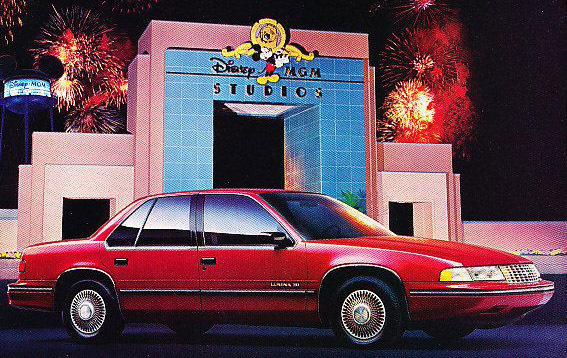 The partnership between Chevrolet and Disney ended fairly quickly just months later beginning in September 1989. A marketing manager for Disney stated that the campaign, while successful and done to the standards of Disney quality, sparked concerns in upper management that the Disney characters were becoming overexposed and associated with non-Disney items. “We want Mickey to be used as much as possible in his natural environment, and certainly never in a way that he appears to be huckstering,” said the Disney manager. I remember those Lumina commercials very well. I believe that was Dale Baer’s studio doing the animation. They also worked on key sequences on Who Framed Roger Rabbit, and would do similar commercials for Disney and other companies. Mickey’s been huckstering since Lionel Trains, watches and Post Toasties.